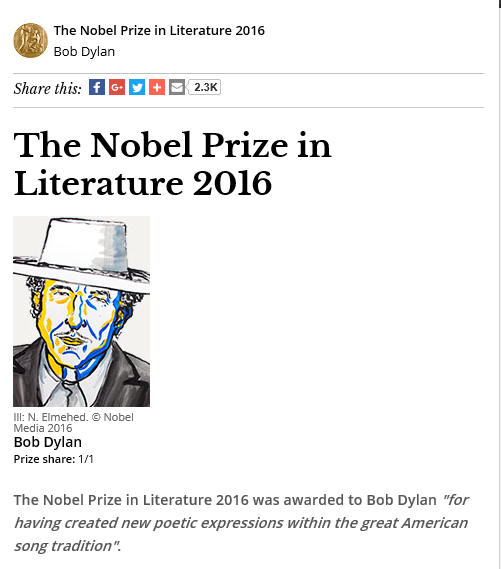 Yesterday, Bob Dylan was awarded the Nobel Prize for Literature. The reason stated was “for having created new poetic expressions within the great American song tradition”. 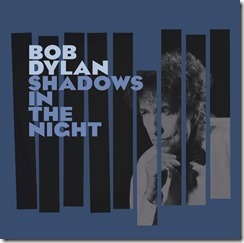 Of course I am delighted, as a long-time Dylan fan. I am not quite his generation, I was too young to take in what was happening in the sixties, but I was there for the release of Blood on the Tracks in 1974, among his best releases. In fact not having much money at the time, I won my copy from the local paper in a competition. 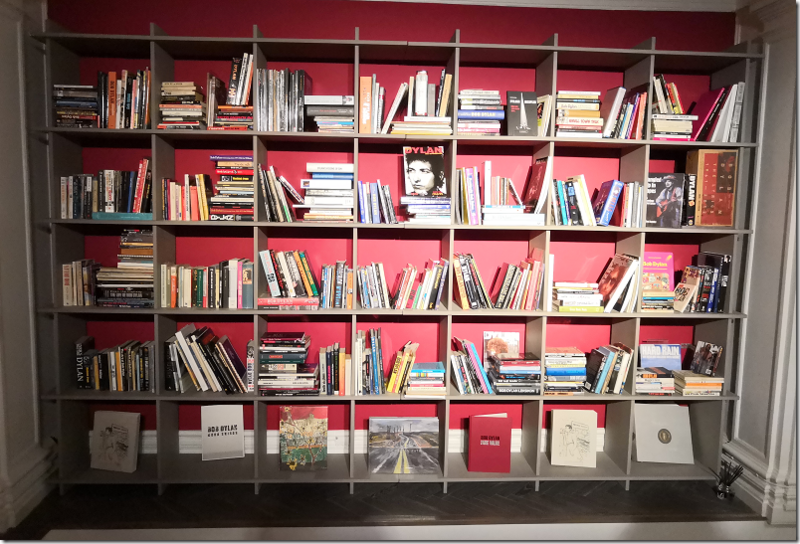 I cannot therefore be objective about this award (and you can debate whether objectivity in literary criticism exists), but I do have some reflections. First, this feels like some sort of establishment recognition that superlative literature has emerged from the popular music of my generation. In one sense Dylan stands as representative among others who could plausibly have been given this award, most obviously Leonard Cohen – who was a poet before he was a songwriter – but also Joni Mitchell and perhaps others, Paul Simon, David Bowie, Paul McCartney, Bruce Springsteen, Van Morrison, Ray Davies, Tom Waits, Jackson Browne, Elvis Costello, and I am sure you can add to this list. On a quick read this looks clichéd: judges spinning words, night stepping in. Then you look more closely. The judges are spinning webs, not words, and they are then caught like flies in the webs of their own making. It is a powerful image, and packs two meanings of “spin”, words and webs, into one thought. And what about night stepping in, what is that about? It sounds like a cliché, but has anyone else used that image? And you can muse about the meaning of “stepping in”; does it mean imposing authority, like a teacher or policeman or God “stepping in”; or is it stepping in like a dancer, a beautiful, natural restoration of order? There is no answer to these questions, but you can say that Dylan’s work, at its best, rewards study and reflection in a way that few can match. "I think Shakespeare sought the widest possible constituency. One reason I keep mentioning Shakespeare is not because I think Dylan is a genius, which I do, but because I think that like Shakespeare he sought the widest possible constituency. I believe the award to be merited then. I also acknowledge though that Dylan does not fit the norms of great writers. He is instinctive; he says he writes quickly, and it seems that he does not curate his own output with the care that characterises most poets. There is also the awkward question of what the words mean, in many of his songs, and whether that matters. Trying to puzzle out meanings is part of the fun, but also gets you lost in a maze, wondering if Dylan is having some kind of joke at your expense. 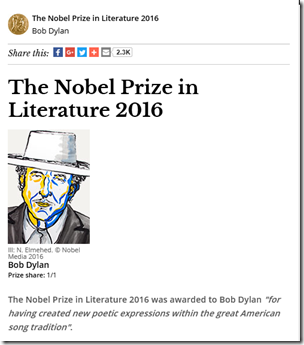 We can conclude I think that Dylan did not care much about which book it was, or which poet. He cares more about the lines beginning “Every one of those words rang true”, which he uses in most variants, though many performances omit the verse entirely. 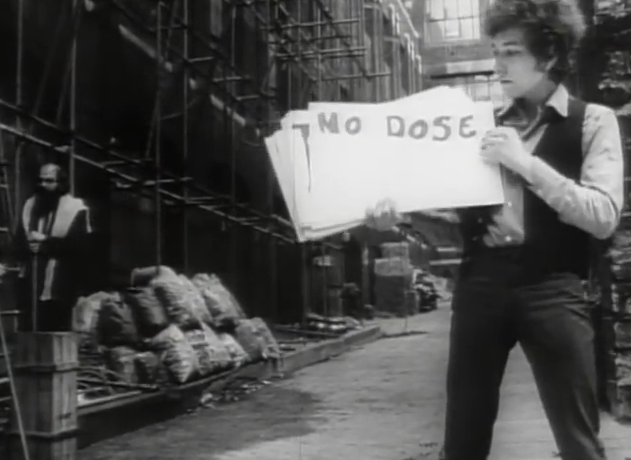 but those cards are a humorous counterpoint to the words, not a transcription of the lyrics, and probably written by Allen Ginsberg (the man on the left in the video) rather than Dylan. Incidentally, the lack of any reference to “don’t tie no bows” is why I cancelled my order for the very expensive edition of the Lyrics since 1962, supposedly giving variations, published in 2014 and edited by Ricks and Lisa Nemrow. Someone needs to do a much better job, encompassing live performances as well as released albums. You never know then when Dylan is playing with you, or just being careless, and sometimes he just throws words together in evocative ways and the search for explicit meaning is unrewarding. 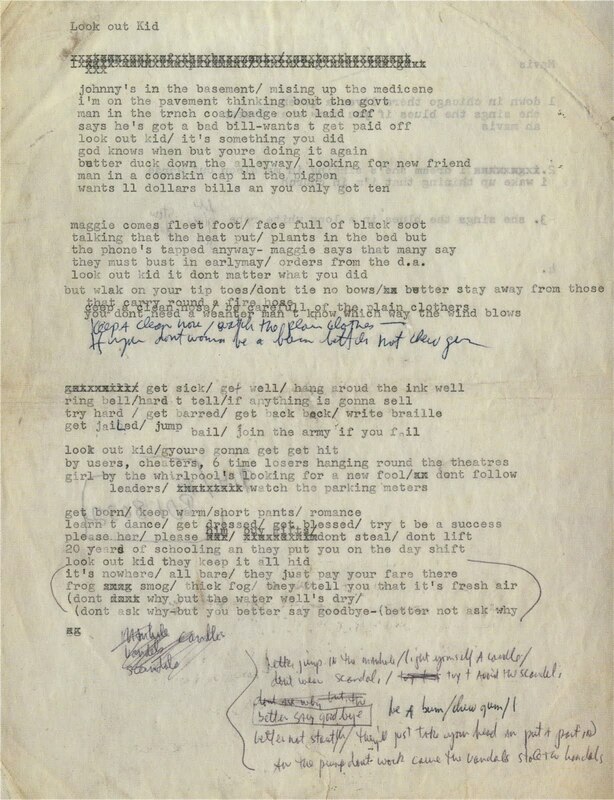 I encourage anybody who has not done so to explore the work of Bob Dylan, though recognising that it is not for everyone, and some cannot get through the “voice like sand and glue”, as David Bowie put it. 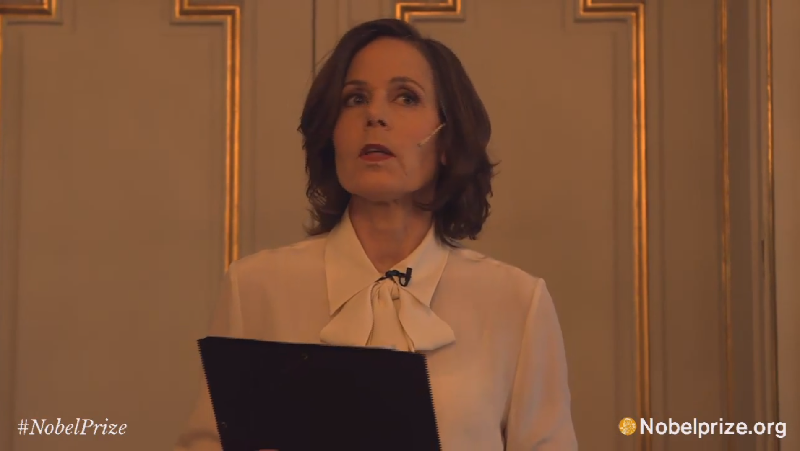 The Nobel prize is deserved, but it is a curious body of work, and it will be a long time before we can get anything like a true perspective on it. For me that does not matter; I am happy to enjoy it. I played this last night; for some reason the words just bowled me over. What is it about? It is about escape I suppose, a dream of freedom from this world of “crazy sorrow”. It is also about music as a gateway to another world. It is a spiritual song; we escape what is frozen and haunted and we arrive on the beach alongside the infinite sea. And then, brilliantly, a reminder that cold reality will return tomorrow. 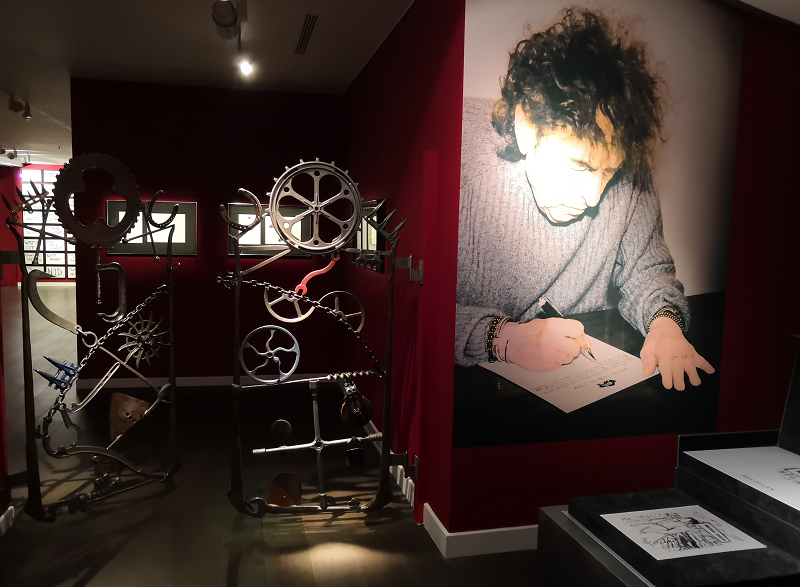 Dylan’s gift is to come up with phrases that sound both striking and familiar – “the foggy ruins of time” – and yet, did anyone before put those words together in that order? I doubt it. Yet these phrases come tumbling out: “the jingle jangle morning”, “skippin’ reels of rhyme”, “to dance beneath the diamond sky”. You could write an entire song based on just one of these. When I think of the song, two images come to mind. One is Dylan himself singing it; I was fortunate to hear him perform this at Brixton Academy in 1995. Another is a busker, any busker, sitting in the street strumming and singing this song as a way to transport himself and every passer by to a better place. Note: all the words are here. 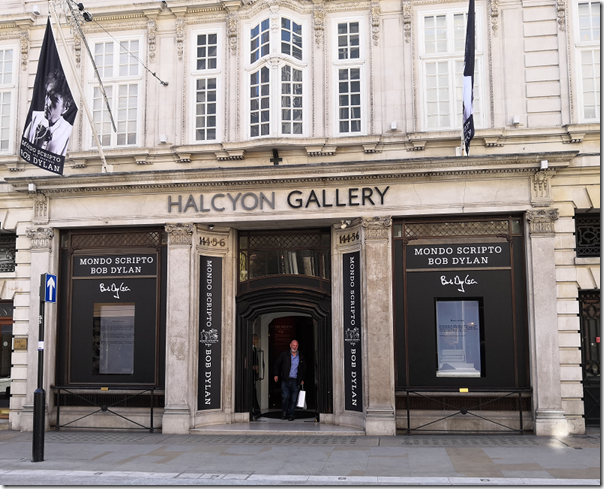 Yesterday I attended the Bob Dylan – Drawn Blank exhibition at the Halcyon Gallery in London. 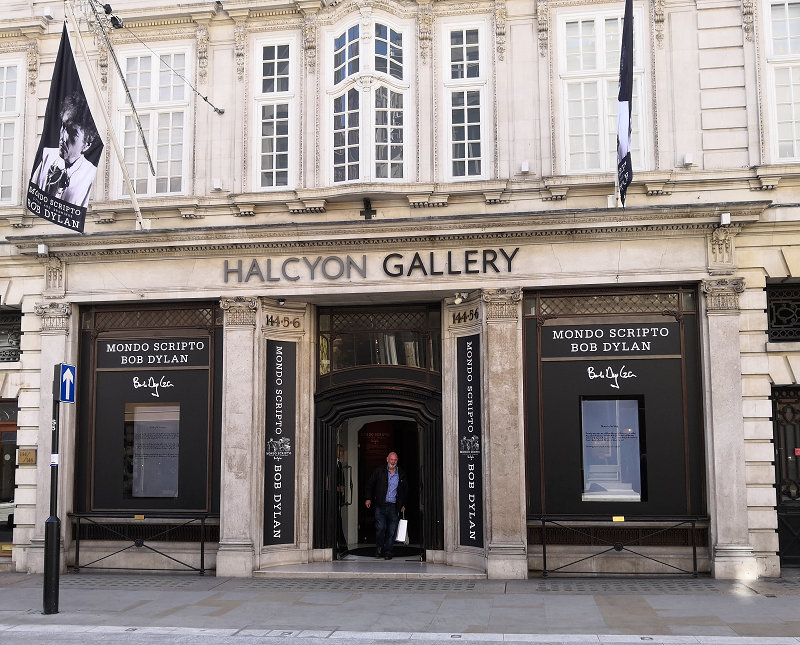 This is a smart gallery near Bond Street; the exhibition is free but this is also a highly successful commercial enterprise. 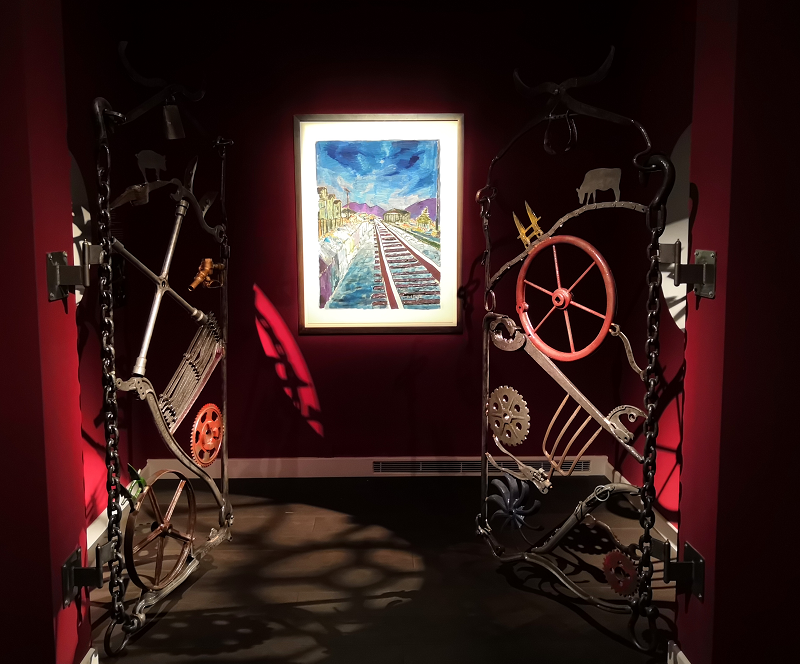 I really enjoyed the exhibition and recommend it highly. It is open in London for a few more weeks; following which I gather there will be a world tour. The origin of the pictures is unusual. Dylan drew some sketches while on tour (then again, he is always on tour) between 1989 and 1992. These were published by Random House under the title Drawn Blank. 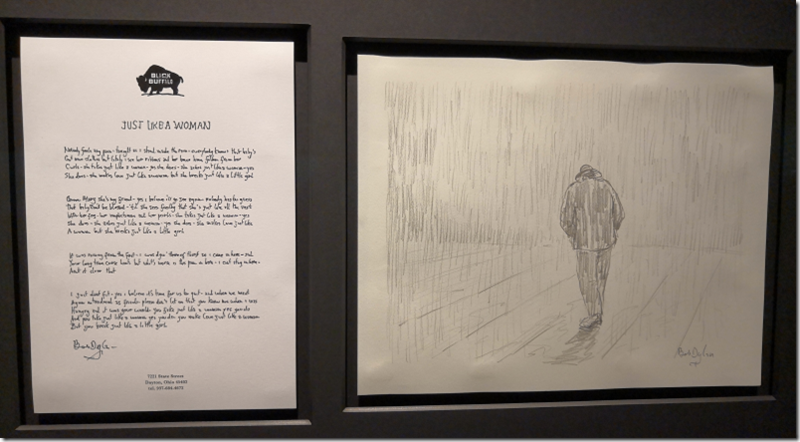 A museum curator called Ingrid Mössinger picked up on them in 2006 and got Dylan to agree to reworking them for an exhibition and for sale as originals and limited edition prints. 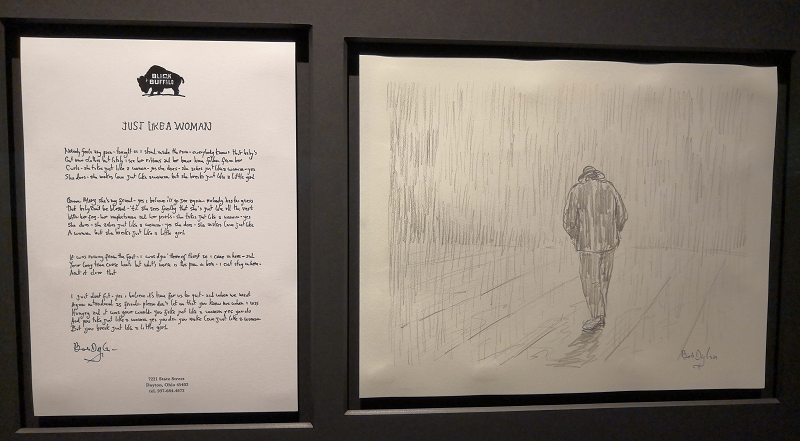 The original drawings were scanned, enlarged, and printed. Dylan then added colour by painting on them, mainly over a period of 8 months in 2007. Some, possibly most, of the drawings were painted several times; Dylan being Dylan, he used different colours each time. This means that what you can buy is either an unique painted print, for sums of £25,000 and upwards, or a limited edition coloured print, for sums of around £2000 upwards. Note the “upwards”: the prices I saw were several times larger on many of the pictures. I also noticed that most of the paintings were already sold. The exhibition is on several floors, with the paintings on the lower floors and the prints above. I spent a happy hour or two looking at them. I have no idea how they rate as art; I cannot separate them in my mind from the Bob Dylan I know as a singer and songwriter. The pictures have a certain naivety; but I found them rich in meaning as well. He gets perspectives slightly wrong at times, but in a charming manner. For example, there is an image showing a timber porch and stairway beyond which you can see cars driving up a hill. They are like toy cars and one is at an especially odd angle, but it is quaint and humorous. Dylan seems interested in angles; he draws a car parallel to the banister of the stairway; we see pillars and telegraph poles leaning this way and that. In a memorable quote on one of the walls Dylan recalls visiting an office and seeing a “blazing secretary”; who else would put together those two words? 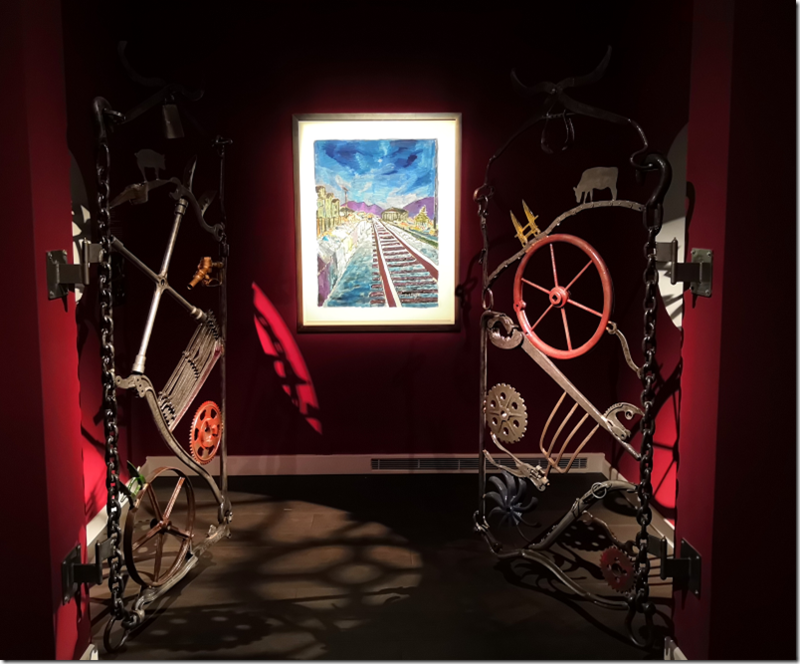 For me it evoked a woman with deep passions who keeps them constrained and hidden during her humdrum working day – though who knows if that was what Dylan meant? If the prints had been a few hundred rather than a few thousand pounds I might have scraped together the money to buy one or two. As it was, I contented myself with the books. 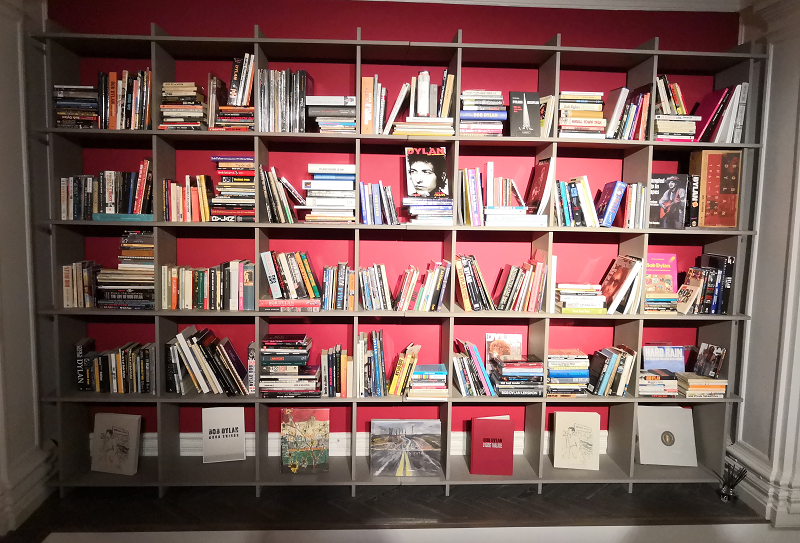 The hardback exhibition book is a well produced collection with nearly 300 pages in large format; at £39.95 it struck me as pretty good value. There is also a cheaper paperback which just has the prints. Being a fan, I bought one of each. Is the rebel Dylan of the Sixties now totally owned by the establishment? I fear so; but it is a compliment as well.